The recent report of the Comptroller and Auditor General on Air India painted a picture of a pauper, a far cry from the iconic Maharajah that it used to be: Accumulated debt of more than ₹ 385 billion; an interest burden that jumped 36 times; and, quadrupling of losses in four years. Additionally, it suffered an embarrassing blow when Star Alliance withdrew its application after lengthy delays in the qualification process. Yet, the report offered a ray of hope, saying the airline can be nursed back to commercial viability, citing its “inherent strengths". What can Air India do now to restore its former brand? It is clear that the pseudo-private enterprise model of Air India is not working. It neither enjoys the full benefits of being a government enterprise since it faces competition in the open market, nor does it compete effectively with its private counterparts. The bankruptcy restructuring process provided the leverage and the fear of liquidation, a burning platform to transform. Air India may not benefit from US bankruptcy laws, but it can certainly apply its principles. Air India has been bleeding money for several years now. Its revenue increased 76% in 2010 from 2005, its last profitable year. However, labour costs have almost tripled and other cost categories have outpaced revenue increase. Including a whopping ₹ 24 billion (almost 20% of revenue) of interest charges in 2010, the operating margin is negative 42%, a disastrous, unsustainable result. Some of this is due to a “fare war" strategy to boost passenger loads to compensate for its lack-lustre service, which in turn is driven by disenchanted employees. Its management and employee ranks compare unfavourably with its competitors, contributing to the cost problem. Poor service, an aggressive pricing strategy, high costs and heightened competition have resulted in significant losses in market share and profitability. Its executive management team, largely comprising bureaucrats without significant airline experience, can be a liability in a complex business badly in need of transformation. It urgently needs to identify executional imperatives that will create some success and improve employee alignment and customer service. Any turnaround requires the right management team—one that specializes in airline operations and corporate restructurings, and has the authority and autonomy to execute the transformation. Privatization, as a rescue mechanism, is a non-starter without a significant restructuring plan that improves both revenue and sheds costs. The management team needs to devise a restructuring plan, similar to its US counterparts, that has three components: a plan to ensure profitability (why shareholders should invest), an employee value proposition (why employees should embrace this), and a customer service plan (why customers should choose Air India). Successful execution of this plan will open the door to privatization in the future. But without restructuring, the Maharajah is staring at its demise and the taxpayers will ultimately foot the bill. The restructuring plan has to drastically eliminate waste, optimize the cost structure, and create a realistic revenue plan, based on profitable routes and right fleet composition. The plan to grow itself out of the current woes is a particularly risky one—revenues may not materialize as planned and the bloated cost structure gets applied to the expanded network leading to further financial deterioration. US restructurings have typically resulted in “right-sizing" the fleet, translating into a smaller network footprint. There are two other alternatives to a profitable, transformed Air India: (a) continued subsidizing by the taxpayer, which can be ruled out based on common sense; (b) eventual liquidation of the brand and its operations. The reduced capacity will actually benefit private airlines such as Jet and Kingfisher in the form of higher prices and better infrastructure that Air India enjoys preferentially. It might even lead to their sustained profitability that seems to elude them today. 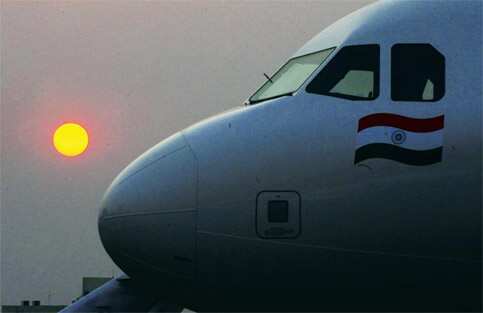 The fact is that India is a blossoming aviation market with double-digit growth forecast for the foreseeable future. Healthy, profitable airlines are in the best interest of the country’s economic growth. Ultimately, a diverse choice of airlines and competitive fares stands to benefit the consumer. All in all, it would make sense that Air India survives and flourishes. The next move is the government’s. Will it let Air India slowly perish as the current path surely projects? Or, will it boldly execute a restructuring plan that will transform Air India into an efficient, customer-focused airline? History tells us that the latter can be done. While mired in a complex political environment, this is a hard-nosed business decision the government cannot avoid and must make. Srisu Subrahmanyam & Ajay Singh are principals at Orchard Group, a consulting firm focused on business performance improvement.